It is not hard to find a story about immigrants in the US. As immigration has a deep-rooted history in the USA, people from various countries have developed their culture in movies, dramas, novels and music. But what about Korea? It has not been half a century since Koreans migrated to the US. When the first generation of immigrants left South Korea and settled in this new place, Korea was very poor and not very well organised, both in terms of system and as a society. This acknowledgement still prevails in the first generation of immigrants; they did not look back on their “mother ship”, only focused on realizing their American Dream on American soil. Then how about the second generation of immigrants or Korean-Americans? What would they think about Korea? Could Korea be an ideal haven for their lives, although they were not born there? The film “Fiction and other Realities” answers these questions. This is also the first feature film by Bobby Choy, a musician and Korean-American. He co-directed the movie with Steve Lee and starred in the movie as the main character ‘Bobby’. The film presents the experiences that the second generation of immigrants have, like the title of the movie, between fiction and reality, they could have had in their lives. Bobby Choy, a New York City-born Korean American and telemarketer, feels foreign where he resides. He just practices in his bathroom, singing while worrying about the shouting of his neighbor. Bobby’s friend Billy offers him a job as a roadie for his rock band’s world tour, including a gig in Seoul. After hesitating, he chooses to take the challenge to see where his father grew up at his age. In Hongdae, where his father took a black and white photo, Bobby meets Ina who does busks just for fun. Bobby Choy is a Korean-American born in New York. Just as portrayed in movies, he would have suffered a lot of discrimination in his life, and he might have been confused by his identity. He represents these complex emotions through the character ‘Bobby.’ So this may be a fictional drama or a reportage movie about himself. For example, during the drinking with Billy, a friend of his and a cool rock star, Bobby says, “If I was born here, I would not have wanted to be white,” so you can get a glimpse of his wounds from the past. As you can see from the first scene, he is an American immigrant who lives in the US but is not American mainstream. He goes to Korean church and eats rice served with kimchi, which means his life still has a strong connection with his native country. Nothing embraces him entirely in the city. In the end, he feels relief in Korea, away from where he physically lived. Ina, a charming busking girl, stands in the opposite position. Her life is deeply rooted in Korea, but it seems to be impossible to be complete in Korea. Bobby is a strange but funny person to go out. Ina is also happy to mingle Seoul with him and spend time walking around Hongdae. For her, however, Seoul is far from her dream and a place of rest. Along with the characters, Seoul is seen as a unique location by the eyes of a person who is not a professional tour guide nor a hundred per cent local. 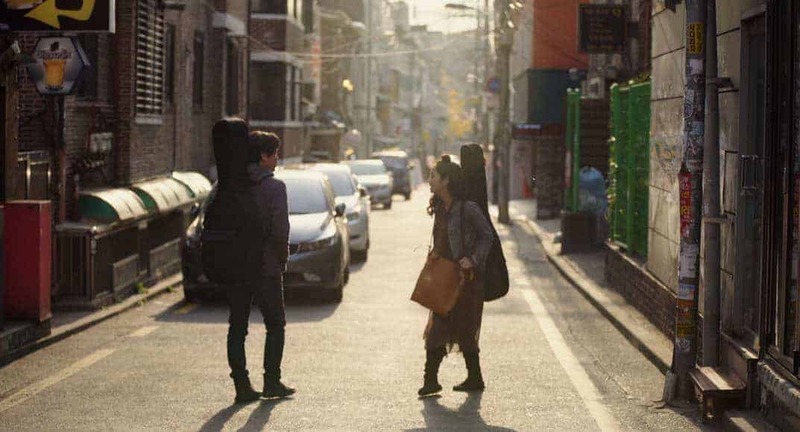 In the movie, the live music clubs in Hongdae, which is not fashionable for Korean people at the time the story unfolds, symbolize an authentic and genuine place for Bobby, where he can express his emotions. The traces of Hongdae appearing in movies are more like looking back to the days when Hongdae led Korean indie culture ahead of the crowd. If you are a Korean, you can recall the memories of the early 2000s while watching the footage of club FF, Rolling Stones, bread, and some familiar faces. It is music that successfully integrates the two languages used in movies. Bobby ‘s Korean is understandable, but you can tell he does not live here. When he gets into a taxi, the driver blames him for not learning his native language. However, when he pretends he is Chinese, his language skill receives big praise. You can imagine Bobby’s communication with Ina is limited due to the language. It is music that goes beyond this. Through his voice, the film shows the power of music to move the mind without knowing the exact meaning. In the movie, Bobby says he only writes sad lyrics, but his guitar tunes are not depressed, and do not drive his sadness too emotionally. “Fiction & Other Realities” is not only a great musical but also a great film. At the same time, it shows the brightness and darkness of the second generation of ordinary immigrants who are not well introduced in their motherland.